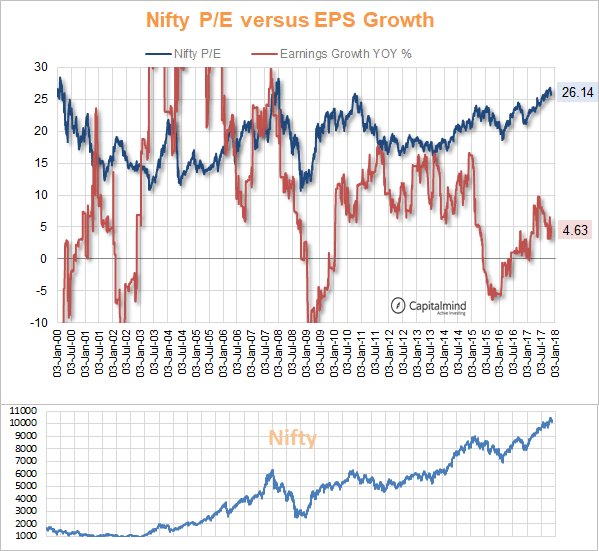 In general, it seems to be a bad idea to speak of the Nifty P/E ratio anymore. So anti national. But just because it doesn’t matter, should we just stop? It doesn’t work that way. So the Nifty has had a wonderful run and here we are today. At 10,300 the index is close to all time highs, and it turns out, so is the Price to Earnings Ratio. 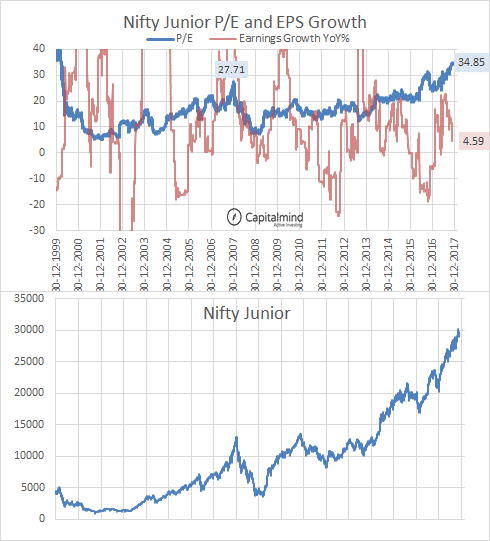 Meaning this: we are paying close to the highest ever multiple of earnings for the Nifty. And earnings growth itself is an abysmal 4.6% after showing some signs of going into double digit growth earlier this year. A 26 P/E is close to the highest ever, with only about 15 days in 2008 being higher, and then about two months in 2000. Both these times were categorized by one thing: a 50% fall in the index afterwards. That isn’t to say that it will happen again, but the earnings growth being this sluggish doesn’t provide comfort either. There’s a lot of boring stuff in the Nifty. Coal, Aluminium, Steel, and some public sector banks. Which haven’t done that well. Let’s look at the Next 50 stocks – which used to be the Junior Index (now the Nifty Next 50). At nearly 35, the P/E is at a high while earnings growth here too is at sub-5%. Most of the results for Q2 are already in, so there’s no excuse of GST, or demonetization this time. Even the broadest index we have – the Nifty 500 – isn’t faring too well. With a 31 P/E at an all time high, and earnings growth of just 6%, we have a problem with valuation. 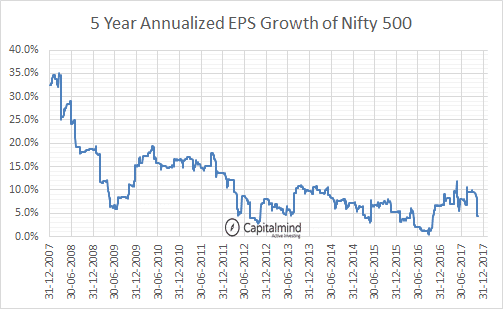 The Nifty 50 and Next 50 have constantly changing stocks that you might imagine make a big difference to earnings. 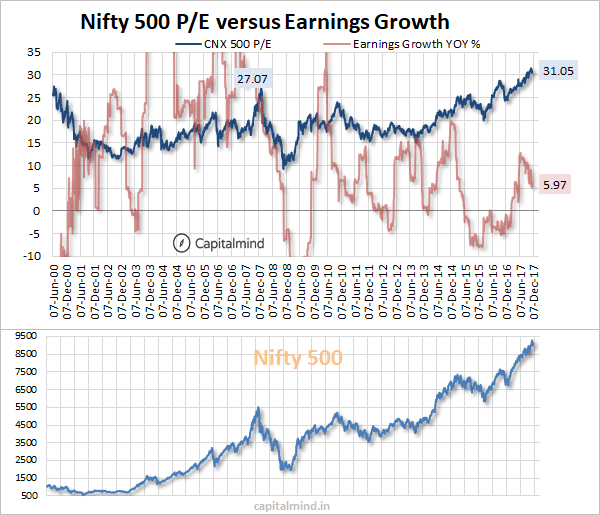 Yet, the Nifty 500 should fare slightly better, but it doesn’t seem to matter – valuations remain high while earnings growth is not really visible. When markets look so “hot”, and continue to move higher on continued investments from both domestic and foreign investors. But at some point, earnings have to catch up, and they haven’t. This doesn’t mean you should sell stocks. It just means we are walking on eggs. Keeping equity allocations under control is a good idea – so when the equity portion of a portfolio has moved too much relative to debt, it may be a good idea to do some rebalancing. The market could fall and it will seem like the reasons aren’t sound, but no one likes to hear the simple reason that we had gone too far. On the other hand, the market could still go up another 20% before falling, so pre-empting it based on some silly earnings growth multiple is perhaps too adventurous.